A BIT OF ROMANCEAND A SLICE OF OLD PUNJABI CULTURESERVED WITH OODLES OF COMIC PUNCHES, IS TRULY WHAT MANJE BISTRE 2 TRAILER IS ABOUT! Be it for the pure entertainment purpose it provides, the kind of material matter it delights in and the heartening tracks that make us pace in a cheerful mood. Punjabi movies are LIT. Lately, the renowned film franchise ‘Manje Bistre’ has been in lots of talks. The makers have served their fans with a lot of breezy and lively stuff by sharing the posters, character posters, songs, challenges etc. And the comeback from the audience they are getting is exquisite! The romantic comedy stars Gippy Grewal, Simmi Chahal, Gurpreet Ghuggi, Karamjit Anmol, BN Sharma, Sardar Sohi, Hobby Dhaliwal and many more. 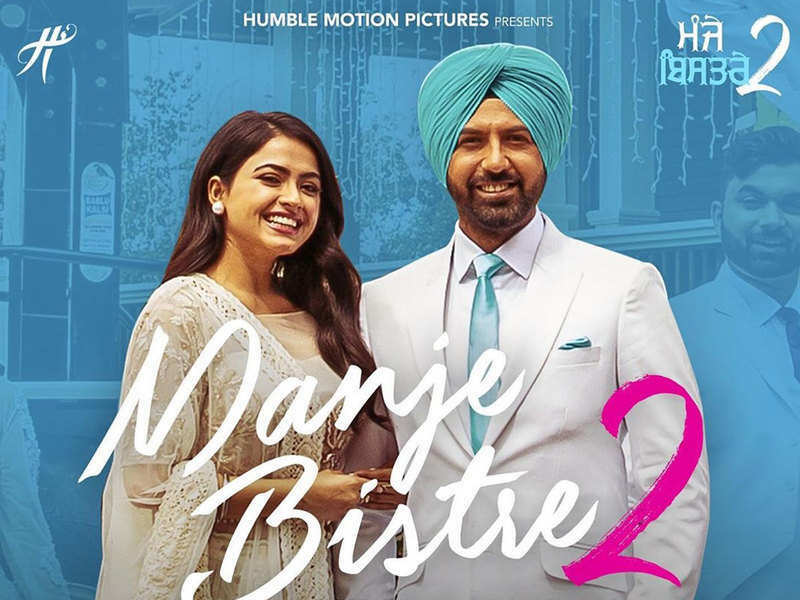 It is the sequel to 2017 released ‘Manje Bistre’ starring featuring Gippy Grewal and Sonam Bajwa in lead roles while Karamjit Anmol, Jaggi Singh, Sardar Sohi and Hobby Dhaliwal in supporting roles. The story and screenplay of the first movie were written by Gippy Grewal and it revolved around a wedding which united two souls. The teaser, written and produced by Gippy and directed by Baljit Singh Deo, is being released on Gippy’s birthday, a perfect gift to the actor’s fans and well-wishers. The audiences are crazed by the trailer and songs and are deluging the artists and the entire team with admiration. The film has already captured a lot of appraisals, all over with the release of the film’s title track, and second track ‘Current’. Talking about the film’s trailer, it gives a sight of sentimentality right at the beginning when we see Sadhu Halwai missing the arrangement of a wedding in Punjab, and the humor which makes you cry with amusement. Manje Bistre 2 is the second franchise of the blockbuster film Manje Bistre which was released in April 2017. The movie is expected to give a power packed performance of laughter, values. Produced under Humble Motion Pictures, it’s all set to release on 19 April 2019.